As I was cleaning the house one Saturday I noticed something really interesting taking shape in the bottom of my toilet. Yes folks, I took a picture of something in my toilet. I know how this all sounds... But seriously, if you had been there you would have been as amazed as me. Toilet Duck cleaner apparently has the unique property of keeping its beautiful blue color even when dilluted with a large quantity of water. Surely somebody must have noticed this besides me? After I poured the cleaner into the bowl I left the room. 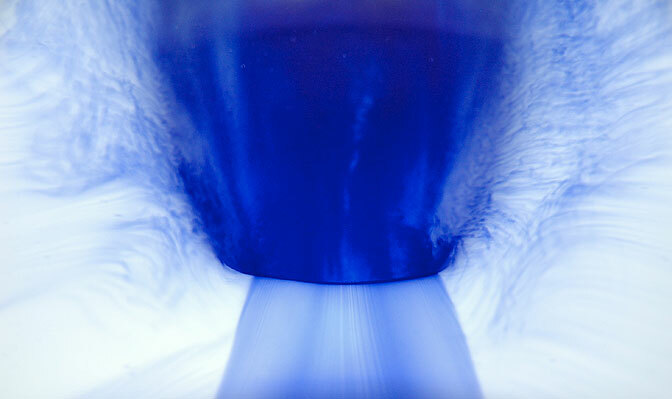 When I came back in five minutes a swirling, shimmering, wall of blue was slowly coating the toilet. Needless to say I had to take a few pictures. These will someday form the basis of a body of work I'm sure. Feel free to copy in the meantime. Nikon D70, Photoshop, and Toilet Duck.